If you're like me, and I pray you are not, your kids stay in their pajamas clean and beautifully dressed for most of the day. If I can scrounge together an outfit, it (a) does not match and (b) is stained and/or dirty. You'd be wise to ignore any sort of fashion advice coming from me. I LOVE these T-shirts. Immediately when I saw the TWIN T-shirts, I said out loud - I want that! BTW - I think 6 of your favorite foods would be great! I would make me hungry, but I love talking about food! I have to add that my girls loved the pictures. They pointed out there were 2 little girls, the shoes and the bear. Awe! 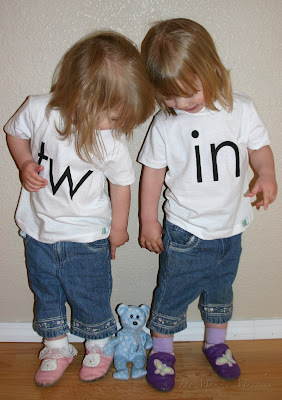 Seeing such cute little girls in the "twin" shirts almost make me want to have twins... Okay, not really, but Oh so sweet that is!! I love those t-shirts!!! I'm gonna have to check out that website!! The pic of your girls is adorable...I love them looking down at the bear!! When Cole and Bella were little, I was so tempted to buy a couple t-shirts for them that I thought was hilarious but my mom said it was cruel so I never did buy them. 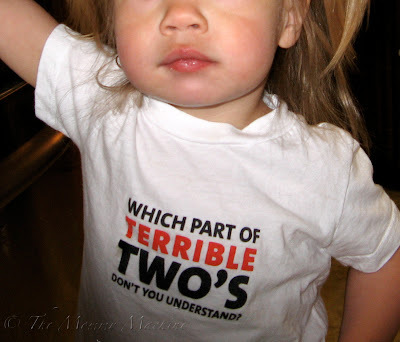 But one shirt said "I didn't do it..my evil twin did it" and the other shirt said "evil twin". It just seemed so fitting at the time! Those are adorable! Cute cute cute. I want to be a twin. My parents are glad I was not. Hee hee hee. I love the TW - IN shirts, too, although I must confess that unless they're standing together (in the right order) most people don't get it . . . they just see a kid with a big TW on their chest and wonder what that means. lol! That makes the shirts even funnier Kim.